Attorney Walt Bachman has drawn from a 25-year blue-ribbon career as a successful trial lawyer and legal ethics specialist to reveal sweeping and fundamental changes in legal practice in America—and in the nation's attitudes toward law and the legal system—that are affecting lawyers and their clients in countless ways. With disarming candor, humor and concern for the law and his profession, Bachman confronts the toughest dilemmas of the "legalization of America" and sheds new light on what life is really like in the profession every one loves to hate. 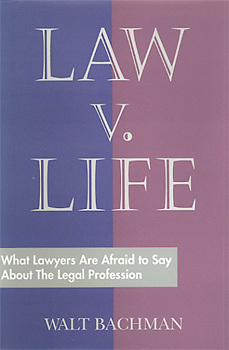 He describes the unique stresses lawyers face, the increasing demands of the legal marketplace, the "moral neutering" imposed by a lawyer's ethical duty of advocacy, some blunt truths about clients, and the deep tensions between lawyers' professional and personal lives. Walt Bachman has been an attorney since 1970. In his unusually varied legal career, he has been a litigating partner in both small and large law firms, a chief deputy district attorney, and, for three years, the chief prosecutor in state legal ethics cases. He has law degrees from Oxford University where he was a Rhodes Scholar, and from Stanford University. A past bar association president, he has served on the ABA's Standing Committee on Ethics and Professional Responsibility and has taught and lectured widely on legal ethics issues. It is said of the 11th century patron saint of lawyers, St. Ives, that he was both an honest man and a lawyer—a marvel to the people. Here's another, and just in time. Anyone practicing law, teaching it, learning it, studying about it, or thinking about doing any of these things should read Law v. Life. It embodies much of the wisdom that a lawyer will need to practice both successfully and sanely in late 20th century America—and does so in a modest, elegant, and refreshing way."